It’s more of a general method than a hard and fast recipe. 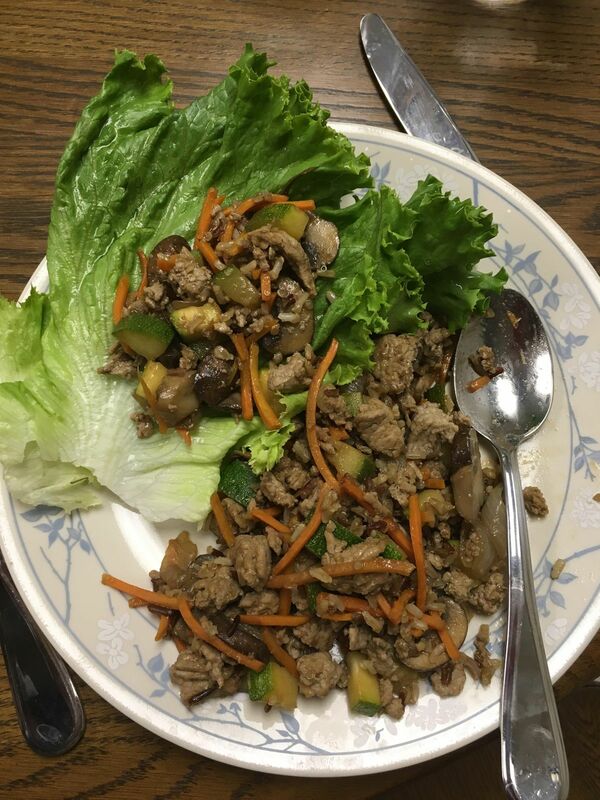 Sometimes my Asian Turkey Lettuce Wraps contain carrots and zucchini. Other times, they feature bell peppers and snow peas. Use the vegetables your kids will eat -- because nobody needs a dinner table battle of wills. Asian Turkey Lettuce Wraps. 30-45 minutes. Feeds 4-5 adults. In a large nonstick skillet, cook the turkey over medium heat until no pink is visible. Add the onion, garlic and ginger and sauté until the onion is translucent. Remove turkey and onion to a plate. Sauté mushrooms until lightly browned. Add remaining vegetables, soy sauce, vinegar, and wine. Simmer until vegetables are at your desired texture. Add turkey mixture and cooked rice to the pan and carefully stir together. Add black pepper to taste. Serve with lettuce leaves. Garnish with green onion if desired. You can make lots of substitutions with this dinner. It’s easy to switch out the protein, vegetables, and grains. I used to make this dish with 99% lean turkey, but you have to add oil to cook the onion and it has a tendency to dry out if you get distracted. I’ve also made this with leftover shredded rotisserie chicken. Tiny shrimp would probably work, too. And I have even used ground beef when that’s all I had in the freezer. My favorite protein is definitely the 93%/7% ground turkey. My favorite vegetable combination is matchstick carrots (just buy them precut! ), diced zucchini, and yellow peppers. This is a great opportunity to use up any veggies that have been hanging out in your fridge. Broccoli, pea pods, fresh green beans, red bell peppers…anything goes! Use whatever cooked grains you have. I usually have some leftover brown rice or quinoa in my fridge. You could also use cauliflower rice if you really want to veg it up. sodium down, and my family doesn’t do spicy food. Added bonus! There are a couple easy opportunities to get your kids involved. I have my kids use clean hands to break up the water chestnuts and any vegetables they can handle. They also help measure and stir all the liquids together before I add them. Separating and washing lettuce leaves is another great way to get kids in the kitchen! I hope you enjoy this recipe! The last time I made it my kids told me they wanted to have it every week. You can’t get a better endorsement than that. Especially from five-year- olds!